The 2017 MOGSouth Spring Meet will be in Greenville, SC on the weekend of 21 – 23 April. Our hosts for the weekend are Pat and Judy Buckley, as well as Anne and Andy Leo. The have negotiated a great rate for the Hampton Inn Greenville, I-385 Haywood Mall, 255 Congaree Rd., Greenville, SC 29607. Rooms should be reserved using the group code Morgan Car Club or MCC. This will ensure that you get the favorable group rate. The block of rooms will be available through 21 March 2017. So be sure to book early! We will update the web with more details as soon as we get them. Watch this space!! In a quick about face, the Morgan 3 Wheeler has been re-certified as compliant with the Australian Design Rules (ADRs) and will remain on sale. Around two weeks ago Morgan informed its customers and fans that new versions of the 3 Wheeler would no longer be available for registration in Australia from November 2017 due to proposed changes to the ADRs. As such, anyone who had an interest in the distinctive vehicle would need to place their orders soon in order to ensure delivery before the registration cutoff date. Now, it seems, anyone dithering about whether they should get a 3 Wheeler can continue to do so without a hard deadline hovering over their heads. In an update posted to their website, the company’s local arm says that after a submission to the federal Department of Transport it is able “to confirm that the approval for the Morgan 3 Wheeler has been updated and this unique vehicle will now be available for sale into the foreseeable future”. The Morgan 3 Wheeler is available locally from $93,900 before on-road costs. Launched down under in January 2015, the Australian versions of the car already feature a number of design changes to make it ADR compliant, including a quieter induction system, padded steering wheel and dashboard, repositioned indicators and lights, a collapsable steering column, and a wind deflector. We’re still waiting to hear back from Morgan about what the proposed ADR changes were and how they were able to convince the department to re-certify the 3 Wheeler. L-R: Roger Moran, Charles Morgan, Robert Dover. Photo courtesy of the British Motor Museum. 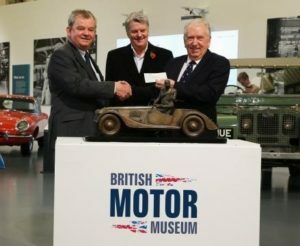 The Morgan Statue Foundation has donated a bronze Morgan memorial statuette to the British Motor Museum, Gaydon, Warwickshire and £22,117 of its remaining funds to the British Motor Industry Heritage Trust (BMIHT). The statuette, named ‘Handing Over’, portrays the founder of the Morgan Motor Company, H.F.S. Morgan standing beside an iconic 1958 Morgan 4/4, handing the keys to his son, Peter, who is sitting at the wheel of the car. That same year, H.S.F as he was affectionately known, handed over the control of the company to his son. Sadly he passed away the following year, just short of the company’s 50th anniversary. The Morgan Motor Company began in 1909 in the spa town of Malvern, Worcestershire. For many years it produced the award-winning, record breaking #Morgan three-wheeler. In 1936 it introduced four-wheelers. Their classic Morgan 4/4 range (meaning 4 cylinders and 4 wheels) is the world’s longest running production vehicle, still being manufactured to this day. The iconic shape of today’s Morgans has remained unchanged for more than 60 years. A record that no other car manufacturer in the world can equal. The statuette was created by Les Johnson, FRBS, one of the country’s best contemporary figurative sculptors. He is renowned for many bronze statues including ‘Dockers’, featuring 9ft high dock workers that stands outside the ExCel Centre, Docklands, London. The presentation ceremony was attended by a number of Morgan Statue Foundation personnel including Chairman, Roger Moran, Vice Chairman, Brigadier Michael Selby and Secretary Brian Iles, as well as H.F.S.Morgan’s grandson, Charles Morgan. In attendance from the British Motor Museum were BMIHT Chairman Robert Dover, Managing Director Julie Tew, and MuseumCurator Stephen Laing. The award-winningBritish Motor Museum and Collection Centre is home to the largest collection of #historic British cars in the world. It also has an archive that contains more than one million items from technical records and publicity material to photographs and film. It’s a fascinating inter active museum hosting exhibitions and events, workshops and family activities. This bronze statuette depicting one of the iconic men behind the British motor industry will now be enjoyed by the tens of thousands of men, women and children who visit every year. Classic Morgan production for Australia currently suspended. After some extended discussions the Morgan Motor Company in the UK has committed to undertaking further tests on the Classic models for Australia, and, if accepted by Canberra, the Classic models will hopefully be available again for sale in limited volumes in 2017. The outcome of the test and submission to Canberra will hopefully be known by end December 2016 or early in 2017. Again as on the 3 Wheeler, the Classics will not be eligible for direct importation even via the revised legislation under consideration in Canberra, as UK specification vehicles do not meet Australian safety and emission standards. All our vehicles are based on European Type Approved vehicles, which are subjected to higher Approval Standards than in the UK, with ADR requirements added on top. Some silver lining to the dark ADR clouds is that the stylish new Aero 8 has now been approved by Canberra for sale in Australia. The first vehicle for Australia will be going into production shortly with arrival in early 2017. Before I was lucky enough to have custody of a vintage Bentley, Morgans were a nice, afford­able alternative. The Plus 4s were quicker than an MG TC, but certainly gave you a vintage ride. Then, as now, they looked the part, even if people would often ask what model of MG it was. As we enthusiasts are wont to do, I had accumulated much Morgan literature to go along with the Plus 4 four-seater I was driving in the late ’60s. So 1 read about H.F.S. Morgan and the three-wheelers he had been producing since the founding of his eponymous company in 1910. By 1936, Mr. Morgan determined that four-wheeled cars were not a passing fad, and began making sports cars with a wheel at each corner of a rectangular frame, in addition to the three-wheelers. One day, I was perusing Hemmings, and there was a mid-’30s Morgan three-wheeler powered by a J.A.P. water-cooled twin advertised for sale. I called, and it turned out the car(?) was in running condition and located near Brattleboro, Vermont, just north of Massachusetts. I was then living in central Massachusetts, so it was not too far away. I bought it, and the question became how to fetch it. Not a good idea to try and drive it home, given my lack of experience conducting such a contraption. I was racing a Formula Vee in SCCA at the time and had a simple open trailer with no floor, just a couple of metal rails to roll the car onto. See the problem? No middle rail, which the Morgan would need, due to its triangular wheelbase. One of my friends transported his Vee on the back of one of those VW pickups with the van front end. Ideal. So with a chase car full of other SCCA buddies, we headed for Vermont one evening. My friend had only two rails to load his Vee, but with all the muscle in the chase car, we had no problem getting the little Morgan on and off the truck. After I figured out how to drive the thing with some degree of proficiency (hand throttle on the steering wheel that went to a different place when you turned the wheel was just one of its myriad idiosyncrasies), I used it around town to do various errands, including delivering our second son to kindergarten. I always felt a bit nervous, since even though drivers over 45 years ago did not have the distractions they have now, they would gawk at this strange little vehicle with which they were sharing the road, paying scant attention to their direction of travel. followed me through the (amicable) separation from the wonderful mother of my first three children, moving to western Massachusetts, meeting the woman to whom I have now been married for 43 years, having two more children, joining a trail riding friend to start a motorcycle business and ending up living near Northampton, Massachusetts. Whew! And the chunks of Morgan were still in their boxes. One of the customers who came to the motorcycle shop had a Brough Superior motor­cycle that he was restoring (some people actually do make progress on these things). When he heard about the Morgan, he thought it would make a great next project. Well, since I was always just about to get to it (Ha! ), he pestered me for a couple of years, until one day he walked into the shop and having sort of come to my senses, I said, “Make me an offer.” He did, and the boxes of Morgan became his. I retained the right of first refusal should he decide to sell it. Sure enough, a few years later I got a call from Tennessee, where he had moved, saying he had done a bit of work on it, it was not finished, but would I like it back? Nope. So he ended up selling it to a man I knew who was the guru of the Vintage BMW motorcycle fraternity. He, too, pecked away it, but passed it on before it was finished. Some years later, I was giving a presentation on the VSCCA at the Lars Anderson Museum in Brookline, Massachusetts, and afterwards the manager said he wanted to show me a strange vehicle he had just gotten. Turned out to be the Morgan, still not quite finished, but almost. Finally, a few years ago, one of my VSCCA Morgan friends called and said, “Your old Morgan is on eBay.” I looked and there it was, almost done, advertised as having once belonged to an officer of the VSCCA. Whether that helped or hindered a potential sale, I will never know. Where is it now? I may find out one of these years. I just hope it is finally finished. PLANS to build a ‘world class’ statue in the town centre celebrating Morgan Motor Company’s special connection with Malvern have been scrapped after organisers failed to raise the money needed to make it a reality.Project organisers and registered charity the ‘Morgan Statue Foundation’ have announced it halted fund-raising and is to dissolve as an organisation after falling significantly short of donations.The foundation proposed to build a life size statue in memory of the founder of the firm Henry Frederick Stanley Morgan at the north side of Malvern Priory Gatehouse, close to the Abbey Hotel costing around £380,000.The statue’s format was to feature a 1958 Morgan 4/4 with Mr Morgan standing alongside his son Peter Morgan sitting at the wheel – the year that he was ‘handing over’ control of the company to him. Organisers hoped the creation would allow Morgan enthusiasts and visitors to be photographed sitting alongside the Morgan founder and his son – becoming part of the statue themselves. They also hoped it would create a focal point in the centre of Malvern and a major attraction for visitors. But the Observer understands the charity received around £140,000 – approximately half the figure required in donations. In a statement, Morgan Statue Foundation chairman Roger Moran said: “After much voluntary hard work over more than eleven years by the Trustees, the Foundation was unfortunately unable to raise the funds necessary for the statue. “Consequently, the Trustees reluctantly decided to halt fund-raising and dissolve the Foundation. 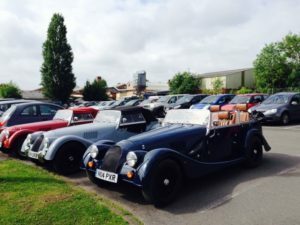 “Attempts to formally recognise Morgan cars with a local statue have been going on for many years and I understand it has been a struggle to raise funds for the venture,” she said. The statue did receive planning permission from Malvern Hills District Council and bosses from the authority have also expressed their disappointment. Simon Smith, economic development manager for the district council, said: “We’re sorry to hear that this campaign has run into difficulties. 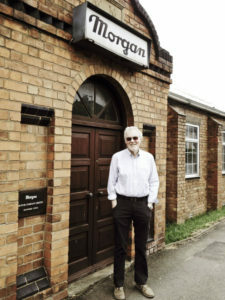 We felt this was a really good project to commemorate the founder of the Morgan Motor Company, and it would have been a great addition to the town. A spokesman from the Morgan Motor Company said the firm did not wish to comment. The Morgan Statue Foundation, whose patrons include Formula One racing legend Sir Stirling Moss, has repaid all identifiable contributors who donated and decided to donate a proportion of the net remaining funds to the Malvern Museum. 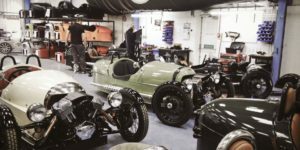 The Morgan 3 Wheeler will be withdrawn from the Australian market from November 2017 due to coming changes to the Australian Design Rules (ADR). Late last week, the company’s Australian arm put out a call for final orders of the rare three-wheel vehicle. In a statement, Morgan Cars Australia said that “further changes to the Australian Design Rules [mean that] the Morgan 3 Wheeler will no longer be eligible for registration in Australia effective from 1 November 2017”. The company was at pains to point out that any cars registered before that date are unaffected by the rule changes. Morgan says that any interested parties should get their orders in now, as production slots are already filled up until the end of May 2017. In order for Australians to get their cars into the country and registered before the end of October 2017, they will need their cars made by the end of July, at the latest. Orders for the June and July production slots will be open until the end of 2016, or whenever they’re filled. The Morgan 3 Wheeler starts at $93,900 [Australian Dollars] before options and on-road costs. To secure a production slot, the company requires a $20,000 deposit. A second deposit of 35 percent of the retail price of the car is required two months before production. As CarAdvice discovered when the 3 Wheeler was launched in Australia in January 2015, the company has made extensive design changes to the car to make it road legal down under. These includes a quieter induction system, padded steering wheel and dashboard, repositioned indicators, extra warning lights, larger mirrors, a collapsible steering column, and a wind deflector instead of a windscreen. Morgan Australia notes that any 3 Wheelers imported from the UK or Europe won’t be road worthy. Peter Egan gets caught in the great Malvern Morgan trap, and is inexplicably drawn to the 4/4. Floating around on a cruise ship, eating and drinking all day in a Hawaiian shirt is all very well, but I’ve always wanted to take a real ocean liner across the North Atlantic specifically to go somewhere. I’d rather face the cruel sea of World War II convoy fame in a sturdy steel ship that cuts through heavy weather unfazed than sit around the pool with a nice umbrella drink in my hand. And so we did, just a few months ago, in a long-delayed retirement trip. Barb and I flew from Wisconsin to New York, boarded the Queen Mary 2 (a stunningly beautiful ship in all respects—and fast! ), sailed past the Statue of Liberty, and arrived seven days later in Southampton, England, in the early morning. Naturally, I had to roll out of bed in the dark at 3:30 a.m. so I could observe our approach. I got a cup of coffee from the cafeteria, walked out onto the chilly promenade deck, and watched the shore lights of the Isle of Wight slide by as we turned up Southampton Water toward our port. There was only one other person on the deck, a dignified-looking gentleman with white hair and a beard. He, too, was holding a steaming mug of coffee. I recognized him right away as Commodore Ron Warwick, the original captain of the QM2 when it first went to sea in 2004. Now retired, he’d been one of the cruise line’s guest speakers on this 10th-anniversary voyage of the ship, and I’d attended two of his afternoon lectures. “You’re up early,” I noted. “My wife and I bought a new Morgan when I retired a few years ago,” he explained, “and we take most of our vacations with it. When I get home, we’re going to Scotland.” The word “Morgan” was the secret lodge handshake, and the commodore and I talked sports cars until we docked. It seemed like an excellent and auspicious way to greet England’s shores. Barb and I picked up our rental car—a red Vauxhall Corsa—and turned west along the coast to visit our Hardy and Lawrence shrines (Max Gate and Clouds Hill) near Dorchester for a few days, then drove north to the Cotswolds, where we left the car parked in Moreton-in-Marsh during a week of hiking. We covered 50 miles in a great circle of lovely yellow limestone villages, sheep farms, river trails, forests, and the ruins of ancient Cistercian abbeys. Not to mention the pubs. Finally, on a bright Saturday morning, we collected our car and headed west. We soon found ourselves on Pickersleigh Road, pulling up in front of the neat red-brick industrial buildings of the Morgan factory. Holy ground. Surprisingly, the gates were open. A sign said all visitors must report to the visitors’ center, so we asked for directions from a man in overalls. We strolled through the grounds, taking pictures of rows of wood-framed bodies and half-completed cars in the many long sheds. A few dozen workers were tidying up for the weekend, putting tools away, or doing last-minute detailing on finished cars. Everyone said good morning with cheerful indifference to our presence. It was like a self-guided tour made in heaven. The visitors’ center was—as advertised—closed for the weekend, so we meandered back to the main gate. As we did, I noticed all the factory doors were now shut, the workers gone. It was suddenly very quiet. When we reached the main gate, it was padlocked. I looked around the grounds and shouted “Hello!” My voice echoed off the brick buildings and died away, unanswered. But of course, that gate was also now tightly locked. I looked around the silent factory and noted that it was surrounded by a 10-foot fence topped with rows of barbed wire, much like Stalag 17. Barb and I looked at each other. Just then, a middle-aged man in a golf shirt came walking past the gate. “Just around the corner,” he pointed. “I hope we don’t have to call the police . . .” I said. I looked and saw that he was right, suddenly thankful that Barb and I had been dieting and walking about eight miles a day to train for our trek through the Cotswolds. 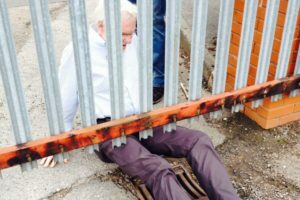 I got down on my back and slithered under the gate’s iron staves like an infantry trainee in a live-fire exercise. My Army training finally paid off. Barb made it too, even though she had no training at all. But it was a near thing, as Churchill might say. Although Churchill himself would still be trapped. I thanked the man for his face-saving advice, and he waved over his shoulder as he sprinted toward the train station. I dusted Barb off, which I thoroughly enjoyed until she made me stop, and then we headed downtown. We found a hotel called the Abbey next to the beautiful Malvern Priory and had a wonderful weekend exploring, paying a visit to the graves of Elgar and his wife Alice in a small churchyard just south of town. Elgar’s Cello Concerto is a favorite of mine, though he’s best known for “Pomp and Circumstance,” which makes me tearfully grateful to be out of high school whenever I hear it. He seemed pleased by this vision but perhaps a bit disappointed that I already knew about it. I didn’t tell him we’d already toured the Morgan factory, too. Before anyone could review the security-camera footage of that little escapade, we sped toward London on the M40, dropped our rental car near Heathrow, and flew home the following morning. I arrived with a suitcase full of loot from the gift shop and perhaps he world’s worst case of Morgan fever. This past weekend, I sold a nice older Stratocaster and two classic amps from my small collection of musical instruments. The money is going right into a special savings account. I’m also taking a hard look at the five motorcycles in my garage to see if I really need that many. The one I won’t sell, however, is the 1974 Norton Commando I finished restoring last spring. I think it might look nice sitting next to a 4/4. I could listen to a little Elgar on the shop stereo while I put it all together next winter.